Monkey Morning 15, Half time on the Kickstarter! We’re now officially half way through the Kickstarter and in a very healthy position indeed. 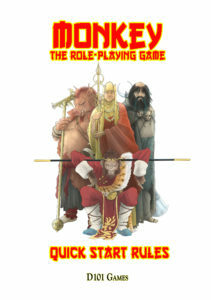 Main Rulebook funded on day one, followed by Stretch Goals 1 +2 which provide extra content for that book + a separate quick start rule booklet which will be be free in pdf form and low cost in print. Stretch goal 3, The Ministry of Thunder funded yesterday, and this will be a 5 scenario book. I’m quite chuffed about this because I’ve wanted to do this for years and now have the funds to get it done properly. We’re now funding the Monkey Companion (which I’ll blog about in detail tomorrow).which is basically a book of short articles and adventures. 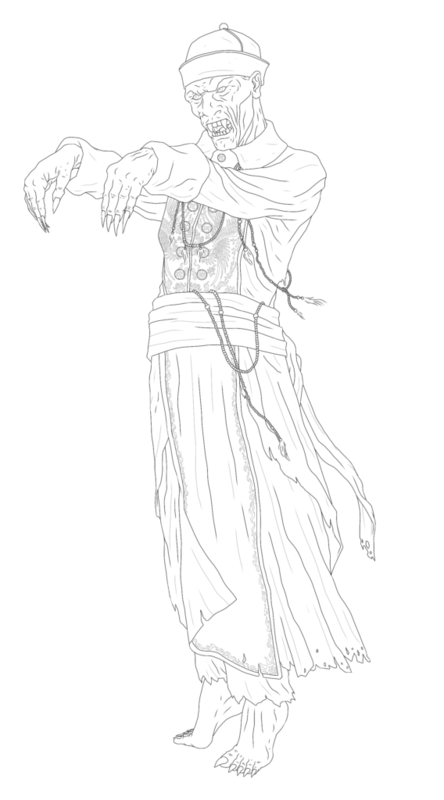 One of these feature hopping vampires from Chinese Kung Fu movies, and Peter Frain has done a cracking job on illustrating one of them. Its Saturday morning, and Day 4 of the Monkey 2nd Incarnation Kickstarter and this is where we stand. Stretch Goal One: If you see Buddha on the Road, an extra adventure in the main rule book and the basis of a Quick Start booklet FUNDED! Currently we are funding Stretch Goal Two: Defenders of the Dragon Empire as a chapter in main rule book that deals with how to create and play mortal heroines and heroes in the game, and we are just under 50% towards being Funded.. If you’ve backed it tell your friends. The bigger this gets the more stretch goals with new content we can fund. If you’ve not backed, but are curious about what this game is about, please click the link below and read on…. Just to let you know that I’m delaying the Kickstarter launch until this coming Wednesday (11th January). Nothing major, I’ve just got a couple of things I want to get sorted before the campaign starts. 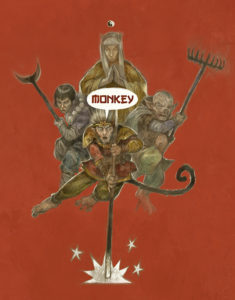 It took fifteen years to write and develop the first edition of Monkey the Storytelling game of the Journey to the West. It was first released in July 2010 at the Continuum Games Convention in Leicester UK. You see this was five years ago, when we didn’t have Kickstarters in this part of the world, so taking it along to the largest con I went to and selling a good fifty copies (about a quarter of the attendees) was a big thing for me. It set the tone for Monkey’s sales, which have mainly been face to face direct sales. One of the aims of the 2nd incarnation kickstarter is to bring the game to a wider audience outside of people who know it from the local cons I’ve run it at or who have come across it online by chance. Below is a gallery of good memories from the 1st edition’s launch five and a half years ago. And so with this post the Journey to Monkey’s 2nd Incarnation Kickstarter begins! Here’s a clip from the Japanese 1970s TV series that was one of my principle inspirations for the game. Day 1 of 23 Days of Monkey, Kickstarter in 22 days on 8th January 2017. So in 23 days the Kickstarter for Monkey the 2nd Incarnation opens on Sunday 8th January. (If you want the chocolate at home feel free to get a tray, label it with numbers 1 to 23 and put a chocolate next to each number). I’ll be sharing the posts via the usual social media I use (G+/Facebook), but if you are a Monkey Fan (or Monkey Manic as I’m coming to call you) please re-share and get the word out. One of the reasons I’m doing the Kickstarter is to get word out about the game further than the people who have come across it from the conventions I go to or have happened across it by chance. So please re-share. Come back tomorrow for the first day of the 23 Days of Monkey!